Honestly? 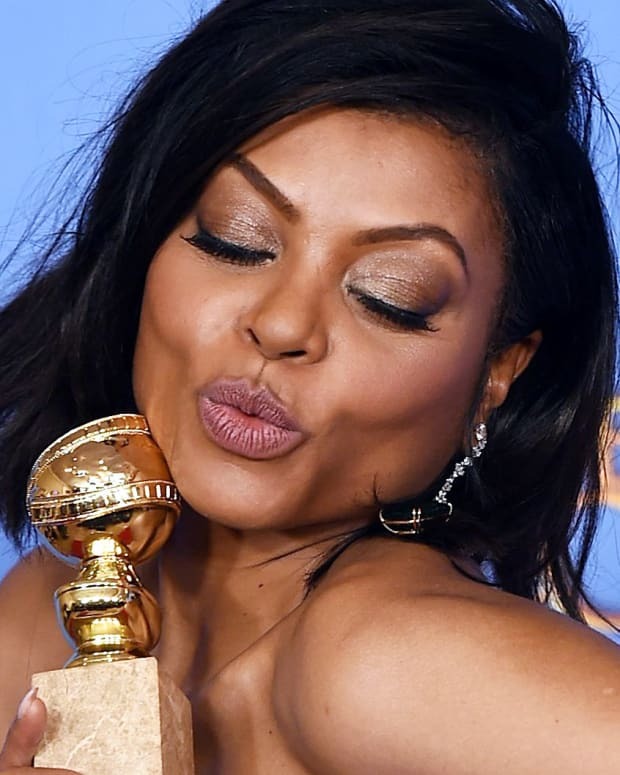 Despite the great lip, it's not my favourite look for her. Thoughts? Emmy Rossum at the 2016 Golden Globes; makeup by Jo Baker. 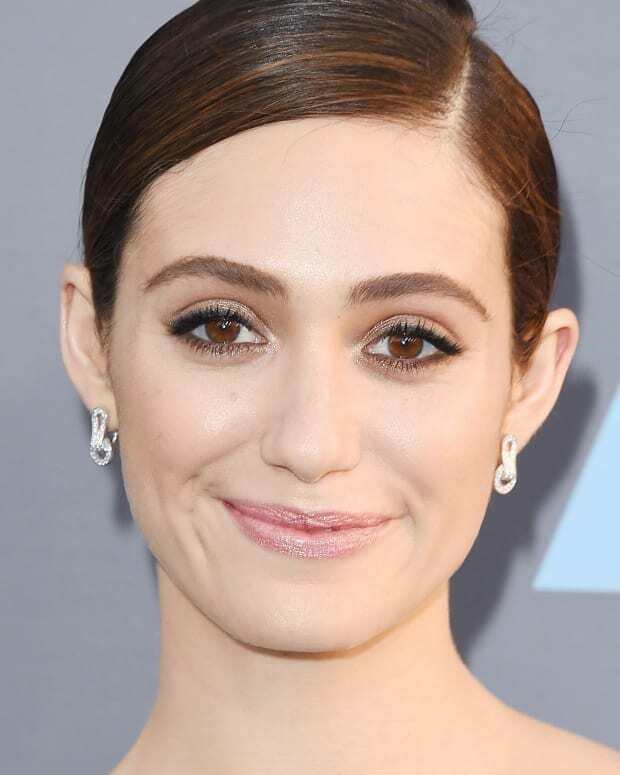 I don&apos;t love saying this, but the makeup Emmy Rossum wore at the Golden Globes isn&apos;t one of my favourite looks on her. It&apos;s nice, but something bothers me about that heavy cat-eye liner, I think. Great lip, though. 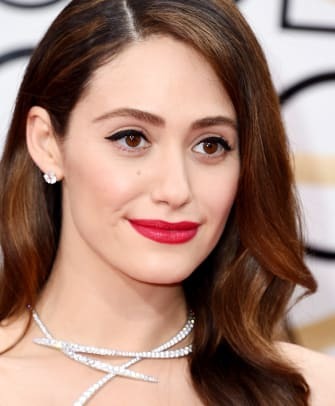 Emmy Rossum at the 2016 Golden Globes: makeup by Jo Baker. See, I really like the liner here, in this shot. Nice and graphic, great wing. But I don&apos;t like it as much here. It&apos;s the liner shape, perhaps – too rounded? Or the thickness. Or maybe I&apos;m just really over bold winged liner + red lips. Here&apos;s a quick breakdown of the whole look by celebrity makeup artist Jo Baker. All totes affordable because it&apos;s Rimmel. Rimmel London Exaggerate in Smoke n Shine gel liner (at walmart.ca and walgreens.com) applied as a liner base as well as smudged into the lashlines. After ensuring the liner was symmetrical on both eyes, Jo winged the edges on the outer eye line up and out. Rimmel London Scandaleyes Thick & Thin Eyeliner (at walmart.ca and ulta.com) traced over the gel liner, finer side of the tip from inner corner to middle, then flipped to the broader side to widen the line from the middle to outer corner, and flick. Rimmel London SuperCurler 24hr Mascara (at walmart.ca and ulta.com) for long-lasting feathery, curled lashes. Rimmel London The Only One Lipstick in Best of the Best (at walmart.ca and ulta.com), a luxurious pigment-rich true red that complemented Emmy&apos;s dress. What do you think? You dig the classic black cat eye + bold red mouth? Or would you have rather seen a different look on Emmy Rossum? Have you tried Rimmel&apos;s new SuperCurler 24hr Mascara or The Only One Lipstick yet?